We hope you learned something about Nisekoi! 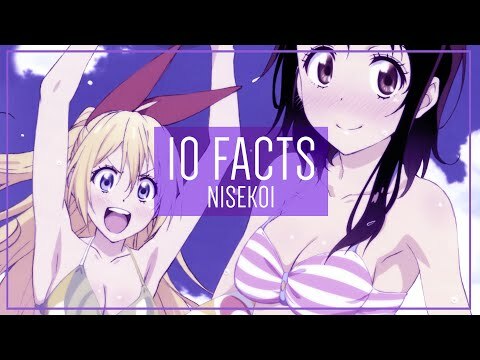 Presented by AverageAnimeFan here's his channel: https://www.youtube.com/use... Did we leave out any interesting Nisekoi facts? Let us know in the comments. If you'd like us to make a fact video on any other anime series in particular, we'd love to hear your suggestions. Make sure to subscribe to QuickTaku, we'll be putting out more '10 Facts You Didn't Know' videos as well as an array of other anime content. Facts you may or may not know! Everything from the boost in manga sales to finding out who is actually the most popular girl! Nisekoi follows high school students Raku Ichijo, the son of a leader in the yakuza faction Shuei-Gumi, and Chitoge Kirisaki, the daughter of a boss in a rival gang known as Beehive. They unexpectedly meet when Chitoge hops a wall and knees Raku in the face. After she runs off, Raku realizes he has lost his locket which was given to him by his childhood sweetheart with whom he made a secret promise. After discovering Chitoge is a new transfer student in his class, he forces her to help him look for the locket. During the search, they begin to dislike each other. Upon returning home, Raku learns that the Shuei-Gumi and Beehive gangs have agreed to settle their feud by pairing their leaders' children. Raku learns that his girlfriend-to-be is none other than Chitoge. For the next three years, they must pretend to be in a relationship to maintain peace between the gangs. This turns out to be quite a challenging task, not only because of their hatred for one another, but also because Raku has a crush on another schoolmate, Kosaki Onodera, whom he secretly wishes was the girl who bears the key to his locket. Various developments complicate the situation, including Chitoge's over-protective bodyguard, a female hitman, a girl who claims to be Raku's fiancée, and the existence of multiple keys. All media, besides that which is owned by QuickTaku,in this video is used under the Fair Use Act, allowing for the use of copyrighted content on educational and/or critical grounds.